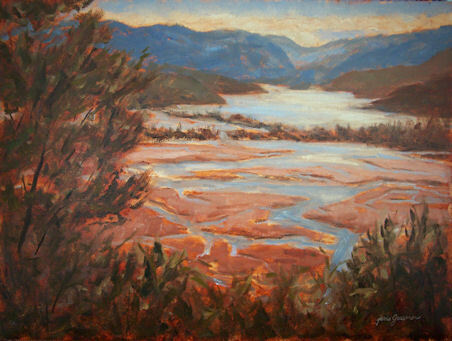 This watercolor painting has an archival ivory mat and backing board to fit any standard 16×20″ frame, and is in an archival polybag. The painting is 11×15″ (quarter sheet), on Fabriano Artistico paper. $390.00 plus $30 shipping and insurance within the Continental United States. For local sales, shipping charge will be allocated to NYS Sales Tax. Please email me at JamieWG@aol.com for International purchases or with any questions. It was a beautiful evening on Friday along the Hudson River in Beacon, NY. 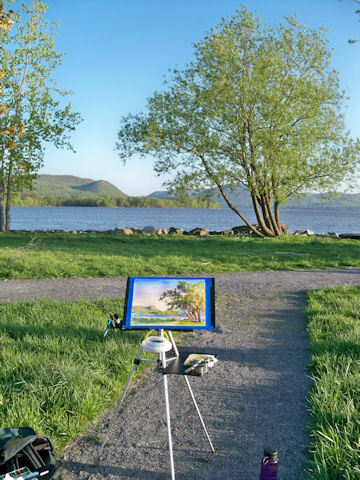 My painting buddy, Sue, went with me to Long Dock after we left Boscobel, and I did this quarter sheet watercolor before sunset. 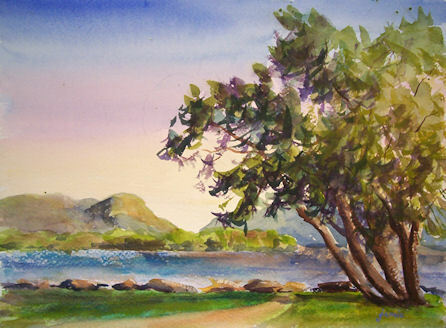 Facing Cold Spring, this cluster of trees was leaning toward Breakneck Ridge, creating a wonderful composition. 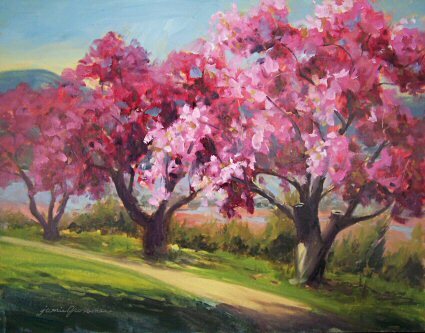 This was painted on one of those gorgeous spring days when everybody should be outside painting! I went to Tilly Foster Farm to take in the beautiful view of the pond and rolling hills. This little, old rowboat resides at the shore of my neighbor’s farm. 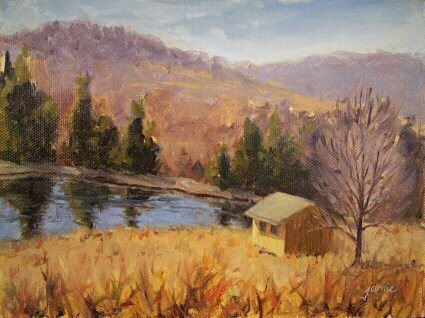 I went on Monday to paint there. I think there are many paintings to be had at this spot! 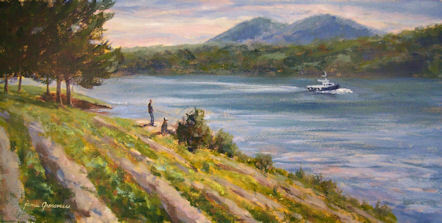 I’m looking forward to exploring this scene with the boat at least a couple more times in watercolor, and can also envision it in other mediums and seasons. 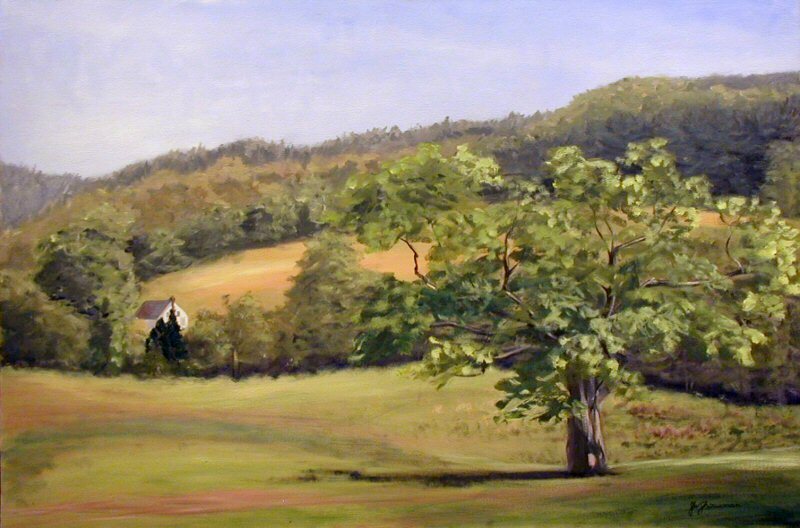 This was painted from a photo I took while vacationing in Virginia and Washington DC. The magnolias and cherry blossoms were absolutely stunning! 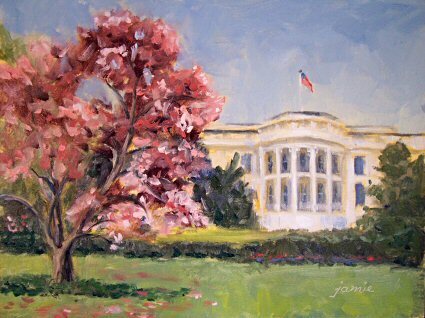 There was no time on the busy family trip to paint or even sketch, but I stopped outside The White House and some of the monuments to take some photos for spring paintings. No signs of President Obama out on the lawn that day! Today was one of those early, overcast spring days, with the foliage just emerging, and the flowering trees starting to bud. 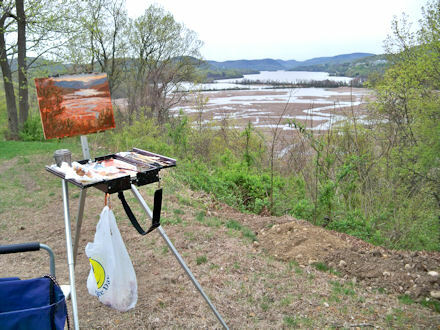 As always, the view overlooking Constitution Marsh and the Hudson River was spectacular. 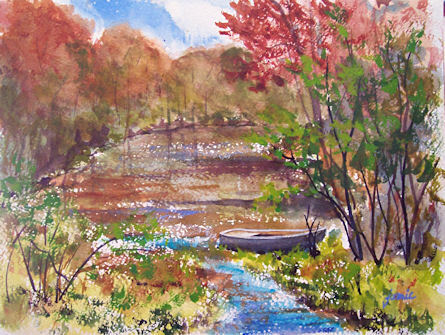 In order to maintain the limited color out in the marsh, I stuck to a two-color palette of Transparent Red Oxide and Ultramarine Blue until the very end, when I added a touch of Cadmium Yellow — just enough to mix a hint of green for the foreground shrubs and treetops. Every once in awhile, we see something so extraordinary that we almost can’t believe it, even when witnessing the scene with our own two eyes. 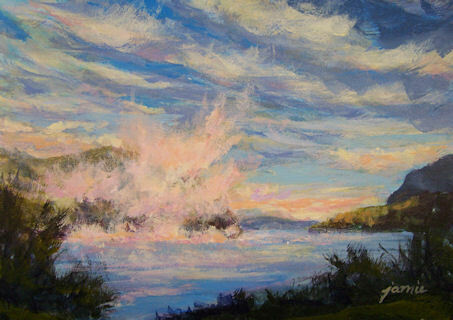 This pink, rising mist on the Hudson River that I saw one morning in Cold Spring as I arrived to paint, was one of those occasions. Initially, it totally obscured the mountains of the Hudson Highlands. As the pink shroud lifted from east to west, the towering hills emerged from the mist. 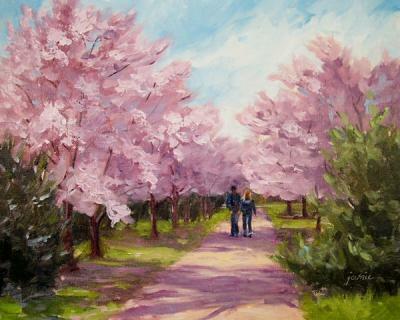 I saw this couple walking among the cherry blossoms in Washington DC. It was the perfect photo op! Blossoms were everywhere—on the path, on the grass, and even on the trees! This large spring landscape is of the old Oak tree at Ward Pound Ridge Reservation in Pound Ridge, New York. Unfortunately, the tree was destroyed during a big storm. I really miss its massive presence in the landscape.